The Final for the course was much like the Mid term. Students had three attempts to answer each multiple part, and the work was graded instantly after each submission. After all three submissions were used up for a problem, students could then see what the correct answers were. The exam was available from June 6th to June 11th, and had a 24 hour time limit once students looked at the first problem. It was also completely open note, and had no associated fee or proctoring required. This final exam however, was much more challenging then the mid term. There were twice as many questions now, covering the content from the first 13 weeks of the class. It also weighed more heavily toward our grades, accounting for 40% in our finale total for the class. Personally, I managed to only get a 79% on the finale, compared to the 96% I received on the mid term. All throughout taking the exam, there was one thought that kept creeping up on me... It could have been worse. Compared to the actual exams they deliver on the MIT campus, the MITx students got off easy. I know this because they released a number of past exams as part of a study packet for our finale. Part of the reason for this is the limitations on the answer input inherent in the current online exam setup. Students answering questions with pencil and paper can be asked to give a much wider range of answer formats such as drawing schematics or giving extended explanations. These old exam questions were also presented in a much more complicated and occasionally esoteric manner. In general, these old exams focused a lot more on asking the student to apply what they have learned in situations they had never been presented with before. Considering how the majority of my educational experience simply required me to parrot back facts, this made me wonder about the implications of how much we demand from students in the class room. The other reason the on campus students have it rough, is because they are only given a 3 hour time limit for the exam and are only allowed to bring 4 pages of notes. I spent almost 6 hours on the exam, not counting time I took off for dinner or to clear my head between problems. If I had been given the stricter exam limitations, it certainly would have changed my behavior in my study and exam prep habits. Despite the challenge, all of the questions on the exam were fair. Only one of the problems was specifically aimed at applying the course material in a manner much more advanced then anything introduced in the class; and this problem made it that fact clear and stated that it should be saved until last. The rest of the problems were primarily focused on content from the last few weeks of lectures, as those concepts were built up of everything we had learned before. The final was tougher then any of the exercises or homeworks we had encountered in the class so far, and it feels good to have survived through it. Now that the course is over, I'd like to take an overview of both the class and how it was delivered. This is one of the first entries into the open education movement from such a prestigious school. There is a lot about the course ware system that was done extremely well, and a few things I hope that they are able to do even better with in the future. 6.002x was an interesting entry level class on circuit design that was easy to follow in the lectures, while also challenging students in the home works and labs. There was a heavy focus on the pure fundamentals of circuit analysis so that the course would apply to both digital (computers) and analog (radio) circuit design. The interactive labs gave a chance to experiment with building circuits in a way that would otherwise be lacking from not being in a class room. Professor Agarwal did a good job transitioning from speaking in front of a class room to creating videos for the web. The unsung work that the other professors in the course did with the tutorials and assignments was also much appreciated, though I wish some of the optional tutorials had been featured more. The availability of both the text book (written by Agarwal) and the discussion forums right on the website was an invaluable asset that made it easy to find information or clarification when ever you needed it. The problem with the course's focus on these fundamentals and abstractions, is that when I looked to other outside sources abut similar circuit design the technical jargon seemed a lot more complex and I found my practical understanding of specific circuit components and circuit configurations lacking. Maybe this is an issue resolved in future courses of this particular curriculum, and heck maybe even the fact that this MIT course was able to explain circuitry in simpler terms is a good thing. But If I find myself unable to communicate on the jargon level of other field practitioners; that makes it much harder to exist within that community whether for hobby or career. 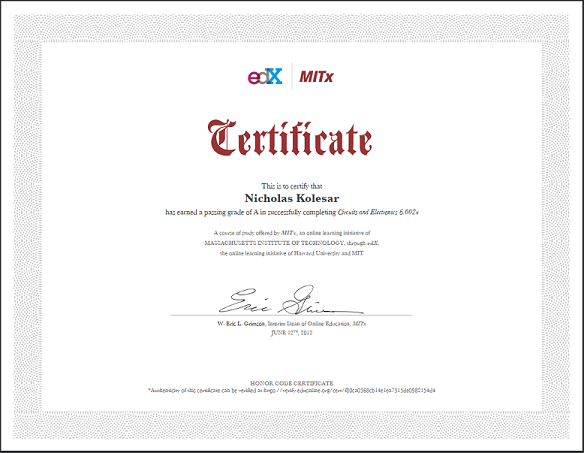 There were a lot of nice features they implemented into MITx, which I hope carry over to the new edX site. The categorizing of each weeks material into tabs helped keep things organized,although I really wish they would have remembered which tabs I had closed/expanded between sessions. The course info page acting as a hub of bulletins, handouts, and reviews worked really well; having a place to get general course information apart from the course content in this way felt a lot like having a clean workspace or desk in person. A lot of little touches like the links to the course text or relevant forum tags on each weeks lecture were very convenient and improved usability and quality of life greatly. I was also glad to make full use of both the transcript and variable speeds on the lecture videos as well. One of the most shining success though was how well used the discussion and wiki forums were. The community was responsible for producing a lot of helpful supplementive material for the class, and was relatively easy to search. The only down side was that older post got pushed off the front boards rather easily. Individual threads easily could have been condensed a bit more to allow more information or return results at once. On the other hand, probably my largest criticize is that as the course got into its latter weeks it very noticeably became more of a chore to complete each weeks assignments. The readings, lectures, and homework's seemed to take up more time, and enthusiasm to explore the class drained away. Is that the course delivery's fault or my own? One of the biggest losses with this feeling, is that there were a number of optional tutorials for each week that are actually very interesting. These tutorials also help to explain a lot more of the application and practical stuff that the abstractions in the main course content don't cover. The exact kind of material that would better prepare someone for the type of advanced applied content in the exams. The other psychological issue i this respect, was probably that students had unlimited tries to answer all of the graded homework's. This made it almost impossible not to get 100% on all of the homeworks, but it also turned the homeworks into a check list or chore more then a source of content reinforcement. The actual questions and level of the difficulty of the homeworks were fine, there is probably just some tweaks needed to the presentation, and expanding on the complexity of the answer inputs, that need to be made in the future. There was one thing that concerned me when I watched the video of the press conference announcing MIT and Harvard's partnership to create edX.What they said, and even more telling what they didn't say, about what kind of cost may be associated with the site in the future. Up until now, any mention of exam fee's or cost of the site were mostly put in the back seat while the general passion and enthusiasm of creating an open education platform seemed to drive the design. Now that it is a project that is being jointly developed, and funded, by several partners; it seems like there is a lot more tension about this issue that has caused them to approach it more delicately. There have also undertones of how online courses offered by these prestigious schools can be differentiated from the on campus experience and the cost associated with their traditional tuition and dorm experience. But I would have hoped that the khan academy model has already shown that these type of online learning tools can be used to enhance the in class experience. Having the lecture portion of the class be assigned online at home, allows teachers and professors more hands on time with the students in actually applying the knowledge or dealing with problem areas for specific students. Maybe this feeling of trepidation is unwarranted. These are issues im sure they are all mindful of, but for now I have no reason not to believe that everyone behind this project is acting in good faith. Apart from some nominal fee to help validate and support the cost of testing, I expect these courses to remain freely open and available for anyone in the world who wishes to sign up. If this level of free sourced higher education becomes successful, it won't only change how online classes and degrees work, but in how our on campus and expectations in educations work as well. And then my friend sent me a link to a BBC article talking about online education, and in it I just happened to casually read that Stanford has teamed up with Princeton and several other universities to release their own free source online university. Their site, Coursera, is allready up and running. They have already started offering classes this spring, around the same time MITx launched. In fact they are offering a few 6 week classes this summer right now, and already have a growing offering of courses including some social science and biology classes. They will even be offering one on Gamification! So yeah. Thats a thing. And I've already signed up for their Cryptology class which started *glances at calender* a week ago. Opps, better get caught up! Guess that means you have another multi part series on online education to look forward to. This time reviewing the west coast universities approach to the awsomeness that is free open acsess university level education, any where in the world!